We have entered a new and interesting phase of aerospace development, one in which we humans on planet Earth are about to embark on missions to Mars and become the invading aliens in another world. We will soon be an interplanetary species. What has been of great assistance in making that date an achievable goal is the work of private industry, like Tesla CEO Elon Musk and SpaceX, the first private aerospace company to delivery cargo to and from the space station; Amazon founder Jeff Bezos and Blue Origin, headquartered in Kent, Washington, in the process of building a heavy lift rocket by 2020; and Richard Branson’s Virgin Galactic, building and testing the first generation of space vehicles for private individuals and researchers, launching from their New Mexico-based Spaceport America. 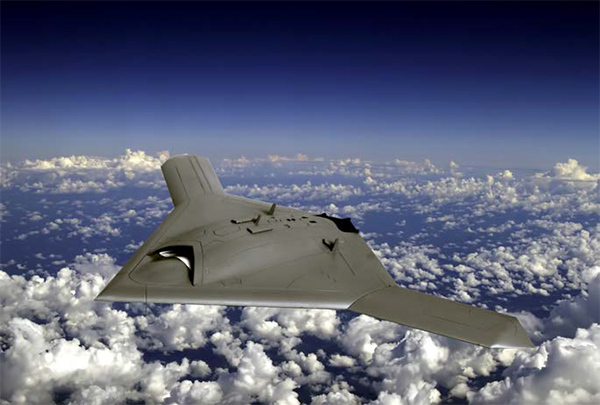 Military aerospace also continues on a strong growth trajectory. In 2016, the U.S. Aerospace and Defense industry supported 2.4 million American jobs, generated $872 billion in sales, and reduced the U.S. trade deficit by a record $90.3 billion, according to the Aerospace Industries Association (AIA). AIA reported that, by industry sector, commercial aerospace accounted for $303.5 billion in sales, while the defense and national security subsector accounted for $146.7 billion. By industry group, sales for 2016 was $342.7 billion for aeronautics, $40.4 billion for space systems, $52.2 billion for land and sea systems, and $14.9 billion for cyber. In the U.S., aerospace and defense exports were led by Washington state, which accounted for 32 percent of total exports, followed by exports from California, Kentucky, Texas and Connecticut. Other states are jumping into aerospace as the demand increases. For example, Michigan, recovered now from the automobile industry decline from years ago, is working to diversify its economic development into the aerospace industry. The state has a history of aviation development, producing 14 aircraft per day during World War II. “While we don’t have a traditional final assembly operation, we do have a huge depth of over 100 companies across the state supplying into the aerospace industry,” Jeff Mason, CEO of Michigan Economic Development Corporation, says. The state is home to GE Aviation, which opened a 35,000 square foot, $14.5 million manufacturing plant in Muskegon in May, 2017; and Pratt Whitney AutoAir in Lansing, where the company has invested $100 million in facilities over the last three years. “All of these companies are growing and expanding their presence in Michigan,” Mason says. In addition to the sales generated by the industry’s commercial aerospace and defense and national security segments, U.S. aerospace and defense generated an additional $422 billion of sales from the industry’s supply chain, which includes $114 billion from firms providing services to manufacturers, according to the AIA. But with more commercial and military launches, space is getting crowded. Space analysts from Fairfax, Virginia based Teal Group have identified 12,230 satellites, probes and capsules to be built and launched to earth or deep space orbits between 2018 and 2037. They estimate the value of these space payloads at more than $272 billion. The payload count for 2018-2037 reflects a 42 percent increase compared to the 8,607 payloads identified last year for 2017-2036, and 140 percent more than the 5,095 payloads for the 20-year look forward in 2016. “There are a number of organizations that are working to make access to facilities and launch facilities more accessible to more than just the organizations with deep pockets,” Chenault says. In northern Tennessee, the Tri-Cities Airport Authority (TCAA) was recently awarded a $4.1 million grant from the Tennessee Department of Transportation’s (TDOT) Aeronautics Economic Development Fund to further the development of its Aerospace Park. The airport currently handles commercial flights for Allegiant, American Airlines and Delta. This new acreage would be focused on aerospace companies that need to have a maintenance repair and overhaul facility. One of the sectors they are recruiting for is passenger-to-freighter conversion work, according to Mark Canty, director of trade and business development for the park. “They will bring in retiring passenger aircraft and convert them into cargo aircraft,” Canty says. The airport is close enough to the Oak Ridge National Laboratory, a national science and technology lab in Tennessee, that it may soon take advantage of the new technological discoveries in advanced materials coming out of the lab, Wilson says. And that possibility has increased the interest of aerospace companies to come in and do business at the park. Artist rendering Boeing’s Aerospace and Autonomy Center at MIT. A 100,000 square foot facility in Kendall Square Cambridge. The U.S. is not alone in the size of their aerospace industry. According to Teal Group, the other four largest are France, China, the United Kingdom, and Germany. Russia has announced plans to launch missions to both the Moon and Mars in 2019. With NASA’s help, Japan is slated to launch a Martian moons exploration mission to Phobos and Deimos in 2024, actually landing on Phobos and returning to Earth with a soil sample in 2029. India had planned to launch a rover to a soft landing on the Moon this year, but may have to wait until 2019. Aerospace development has ticked up at a fast pace over the last few years. In fact, the words aviation and aerospace are being used interchangeably inside the industry because much of aviation is in development of some sort of low Earth orbit craft, either working to launch and position a next generation of satellites, provide a new version of supersonic or hypersonic transport for passengers, or develop a space tourism business that takes a passenger into orbit to experience weightlessness for 30 minutes for $250,000. Policy needs to keep up with fast-changing technology. According to a briefing from the Center for Space Policy and Strategy, the fact that the Federal Communications Commission (FCC) is the regulatory approval agency for space debris compliance for U.S. commercial satellites leads to potential loopholes. The U.S. Joint Space Operations Center tracks about 22,000 objects in orbit right now and issued 1.2 million collision warnings in 2016, according to retired Navy Admiral Cecil Haney, an aerospace senior adviser and former head of U.S. Strategic Command. Generally, the warnings come about five days to seven days before a potential collision, Haney said. Some of those new objects may be coming from a new technological development from The Aerospace Corporation, now experimenting with what they call “Hive.” This is a concept where a swarm of small satellite units form structures in space, then reconfigure themselves for other tasks, much like Legos in space. These Lego-like units could change configuration by command or autonomously to perform various missions, or even disassemble itself to avoid space debris then reassemble once that threat passes. They can be configured into larger structures, which would be too large to fit on one vehicle, do their work in space then get reconfigured for a support structure on a moon or planet. Another aerospace technological development for commercial applications is the Boeing hypersonic passenger plane, unveiled at the American Institute of Aeronautics and Astronautics (AIAA) Forum 2018 in Atlanta. The plane would travel at nearly 4,000 miles per hour. It could be ready to fly within 20 years, according to a statement from Boeing. 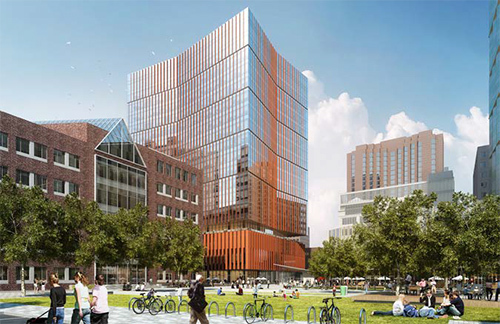 In August, Boeing announced plans to open the new Boeing Aerospace & Autonomy Center in Cambridge, Massachusetts, becoming the first major tenant of the Massachusetts Institute of Technology’s (MIT) new mixed-use district in Kendall Square. Under the agreement, Boeing will lease 100,000 square feet of research and lab space inside a new 17-floor building at 314 Main Street in Cambridge. The new center will house employees from Boeing and its subsidiary, Aurora Flight Sciences, with a focus on designing, building and flying autonomous aircraft and developing enabling technologies. “Aurora Flight Sciences is an example of someone in aviation starting to get a foothold and then entering the domains of a Lockheed or Boeing, then getting bought out,” Dr. Mike Braydich, chief operating officer and senior associate for Aerospace Business Associates, says. “The strength of Aurora that compelled that buy by Boeing is that Boeing was looking at creating innovative structures and innovative aero-designs to start competing in same areas that other companies like Lockheed does, and provide a lower cost solution.”. Greenwood, Mississippi may seem an unlikely spot for aviation-related business, but the Greenwood-Leflore Airport (KGWO) is home to a number of them and is looking for more. Located 98 nautical miles south of the FedEx Superhub in Memphis, the airport is home to the GE Capital Aviation Services disassembly facility. Hundreds of thousands of aircraft parts–from engines and landing gear to avionics and flight controls–have been recycled here. The airport has a 60-acre concrete ramp and a primary runway with an ILS, high-intensity lighting with MALSR, and the strength to support aircraft weighing up to 560,000 lbs. All supporting taxiways are 75’ in width. The airport is tower-controlled and offers radar services via Memphis ARTCC. The Greenwood Fire Department, working with the airport, maintains a robust rescue and firefighting capability, providing a level of protection equivalent to an FAA Index E, or ICAO RFFS Category 10. The airport has 150 acres of land available at very attractive annual lease rates and can offer a broad range of incentives. Greenwood is home to an interesting mix of manufacturers including Hickok Manufacturing Group (an FAA Repair Station), Milwaukee Electric Tool, and Viking Range Corporation. Milwaukee recently completed a $16.8 million expansion of its local manufacturing facility, adding 126 jobs and is planning another expansion. Greenwood amenities include a boutique hotel and spa and regionally recognized restaurants. 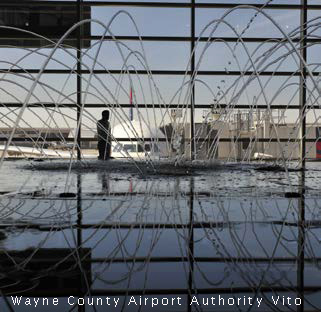 The Detroit Region Aerotropolis Development Corporation is a four-community, two-county public private partnership driving corporate expansion and new investment around Detroit Metropolitan and Willow Run Airports. Primely located between Detroit and Ann Arbor – two of the hottest cities in America – the Aerotropolis region boasts 6,000 acres of development ready land amid a world-class network of transportation infrastructure, including five rail lines, three freeways, two airports, and one American Center for Mobility. Additionally, the Aerotropolis region is part of the Detroit Foreign Trade Zone and less than 30 miles from the Port of Detroit – a network of 29 terminals handling 17 million tons of cargo every year – and the second busiest border crossing in North America. Since 2012, dozens of companies have invested over $1.5 billion in the region. In the last 6 months of 2017 alone, Amazon, Penske Logistics, and Brose North America collectively announced investments of over $350 million on 1.7 million square feet of new industrial space, creating 2,300 new jobs. Moreover, the Aerotropolis Wayne County Airport Authority Jeff Ellis provides a suite of complimentary services to companies considering expansion, including site selection and infrastructure analysis, regional market data and demographic information, governmental relations, and private sector engagement. Civilizations and the industries that serve them have long relied on the movement of people and goods to ensure strategic relevance and economic prosperity. From Silk Road to Amber Road and the Transcontinental Railroad, history is flush with examples of flourishing cities and affluent regions located along key transportation and trade routes. Today is no different and the Aerotropolis is one such region. 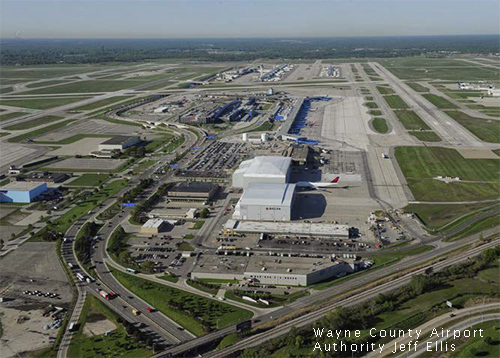 Consider the Detroit Region Aerotropolis for your next expansion project. An interactive real estate database showcasing 40-plus sites between 25 and 500 acres, as well as existing facilities for sale or lease, can be viewed at www.detroitaero.org/propertis. Information on an additional 50 sites between 10 – 25 acres is available upon request. Located in the heart of Middle Tennessee, Lebanon Municipal Airport (M54) is one of the fastest growing airports in Tennessee and is the fourth largest General Aviation airport in the state. The City of Lebanon and the Lebanon Municipal Airport are growing rapidly, with logistical advantages driving that growth. The city’s forward vision and expanding infrastructure attracts people from all over the world yet proudly encompasses southern hospitality, remaining affordable and primed for growth. Ease of access directly from the airport, there is highway access to I-40 and I-840, which intersect with I-24 and I-65 in Nashville, just 20 minutes away. Also served by rail, Lebanon is the point of origin for the Music City Star commuter rail. In the past five years, LMA has more than quadrupled operations with growth to over 28,000 operations in 2018. LMA has a highly focused and service-oriented team with Direct Flight Solutions providing flight services. Direct Flight Solutions (DFS) is solely owned by Heather Bay with highly skilled, focused employees. Aviation services include aircraft maintenance, flight training, affordable fuel, hangar storage or overnight tie down space, LMA ensures a safe and secure airport. Direct Flight Solutions goal is to exceed the needs of our growing aviation transportation network. Along with DFS, there are three flight schools and the office of Wilson County’s Joint Economic Community Development Board. With two runways, a 5000 sf asphalt runway with GPS instrument approach and an 1801 sf rare grass runway, LMA is experiencing unprecedented growth. A multimillion-dollar project on the West side caters to corporate jets and clients, while the East ramp hosts historic aircraft and boasts an active aviation community. With active organizations, several Fortune 500 airfield tenants and over 90% of the top employers in Wilson County utilizing the airfield, LMA actively shares aviation with the entire community. Recently, the airport found itself once again with multiple recognitions including the Tennessee Department of Transportation Aeronautics Division Best Airfield in TN, the Tennessee Aeronautics Commission Award of Excellence, and the Cedar Tree Award. Aerospace is a growing global activity and the United States has a mature and sizable industry to support its growing demands. The active defense posture and robust air transportation regulatory framework, combined with a relatively strong economy, poises the US to profit from the growing $650 billion-dollar aerospace industry. As the Federal Aviation Administration accelerates opening U.S. airspace to commercial use of unmanned aircraft, enthusiasm for drones is growing, with the devices being used by everyone from farmers to firefighters to commercial photographers. Experts believe the projected windfall will reach $140 billion by 2025 is further spurring the race to enter the UAS segment nationwide. Arizona is one of the largest and fastest growing aerospace and defense centers in the United States; coming in third for attractiveness with its ideal climate for aircraft testing and space observation, one of the best transportation infrastructures, and a tax policy congenial to business. Additionally, Arizona ranks fifth among the top 10 states projected to experience the most gains over the next decade with over 4,000 new jobs generating $15.5 million in derived state revenue from a $3.4 billion commercial market nationwide. Mignonne Hollis is the Executive Director for the Arizona Regional Economic Development Foundation which was at the origin of the Aerospace Arizona Association. Established in 2014, Aerospace Arizona is a non-governmental, non-profit, and independent association established to unify principal stakeholders, coordinate key academic and industry activities, and advocate for legislature geared to promoting and advancing the economic strength of the aerospace, space and unmanned systems industry throughout the State of Arizona. 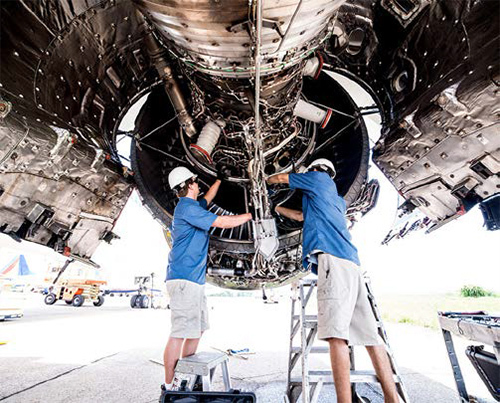 “We saw an opportunity to acquire, repurpose, or refurbish depreciated assets to help bolster the flourishing and robust aerospace industry,” said Ms. Hollis. The association is unique in its ability to bring together academia, corporations, businesses, and entrepreneurs to represent the industry on an equal footing. Professional industry roundtables, networking events, industry tours, forums, symposiums and conferences organized by the association provide excellent opportunities for gathering, associating, and coordinating activities and ideas that directly relate to advancing the industry. This leadership positions and allows Aerospace Arizona Association to play a principal role on key projects that require coordination between state agencies, industry, academic institutions and local governments, including but not limited to aerospace technology research, development, testing, manufacturing and commercialization. Moses Koyabe, President of the Association’s Advisory Board, points out some of the major achievements, accomplished quickly which have repositioned Arizona on a national and international map for UAS innovation. He states, “In partnership with local organizations such as Arizona Technology Council and the Arizona Commerce Authority, our association now boasts a geographic, technical, and policy breadth that is opening the door to opportunities that leverage Arizona’s concentration in aerospace, space, and unmanned systems and its natural advantages for designing, manufacturing, testing and flying. Under a Private-Public-Partnership with the City of Benson, Aerospace Arizona Association opened an Unmanned Aircraft Systems Innovation Center at the under-served airport in Cochise County. A growing number of tenants are now testing and flying new drone technology at the site. 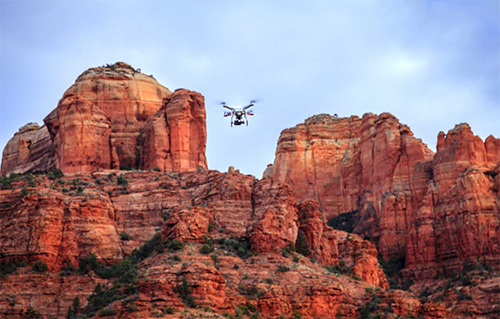 The Arizona Aerospace Association will be hosting its third annual UAS Summit and Exposition at the ASU Polytechnic Campus in Mesa, Arizona next November 7-9, 2018 (www.aerospacearizona.org/summit2018). Industry leaders and users from both the defense and commercial sectors of aerospace will gain access to the latest updates in policy, technology applications, and the most promising developments in Arizona and the industry in general. 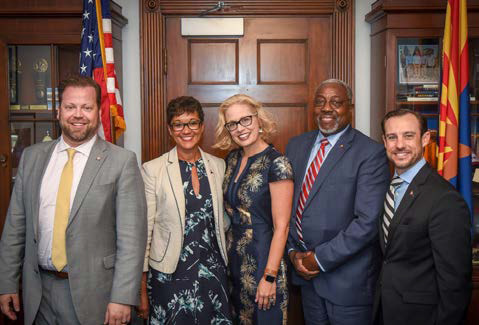 Aerospace Arizona Association is excited about the potential it sees between academia, private industry, and government agencies as it continues to grow its membership roster. The City of Ontario, located in Southern California, is “Leading the Way” with urban lifestyle districts that create sustainable places to live, work and play. Just 35 miles east of downtown Los Angeles, the City of Ontario is ideally situated as the gateway to Southern California. At the center of the City is the Ontario International Airport, which is the 15th busiest airport in the nation measured by air cargo. Major airlines such as American, Delta, United and Southwest, offer daily passenger service through the airport, and plans are in place to add a third terminal as traffic continues to increase. United Parcel Service (UPS) has their Western Regional hub located at the Airport, which averages 38 planeloads of packages a day. Ontario offers a transportation corridor that extends throughout Southern California and across the U.S. and sits 45 miles from the largest ports in the U.S. Ontario provides strategic access to the Ports of Los Angeles and Long Beach through its interconnected freeway and rail system. Ontario also offers the advantage of the Foreign Trade Zone, which allows products to be stored, manipulated, manufactured, and exhibited without paying customs duties – unless the items enter into the U.S. economy. The ability to increase international sales, realize greater export potential and succeed in global markets is often a deciding factor for location, relocation and expansion into Ontario. The City also handles the mass of freight transport – via both rail and road. Three major interstates crisscross the City and the surrounding area: Interstate-15 from San Diego to Las Vegas and beyond; Interstate-10 from Los Angeles to Phoenix and beyond; as well as State Route 60 for easy regional access. Whether you’re just starting your company, looking to relocate or planning to expand, Ontario officials know the best way to attract business is by making it easy to do business. The City of Ontario has expanded by listening to business’ needs and constantly improving its business environment to strengthen its competitive advantage in the marketplace. To find out more information about the advantages of doing business in Ontario, California visit www.ontariothinksbusiness.com or call 909.395.2005.